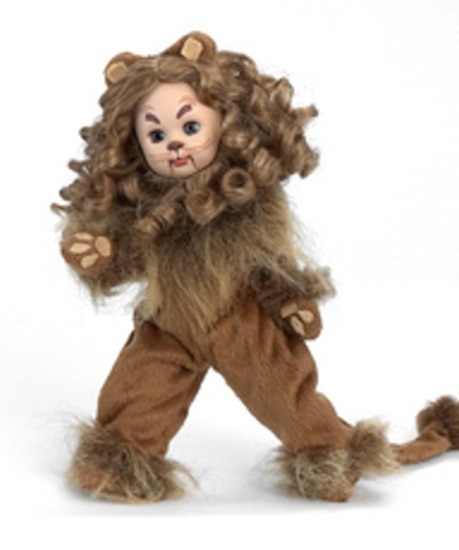 Madame Alexander introduced a new version of the Cowardly Lion as part of the Wizard of Oz 2012 Collection. This is an 8-inch boy with blue eyes and special face paint, and has a magnificent mane and beard of Taffy-Tan curls. He is dressed in a brown plush jumpsuit and matching mittens and booties. Fabric ears that are attached to his mane feature an embroidered detail. Tawny colored "fur" surrounds his neck, wrists, and ankles as well as the tip of his tail. As the story goes, he accompanied Dorothy to see the wizard to get some courage.